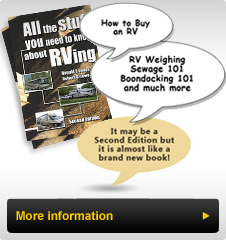 Most RVs are equipped with a leveling system which allows the RV to be levelled prior to extending slide-outs. There are two common styles: Electrically operated and hydraulically operated. Leveling systems on diesel coaches equipped with air ride suspension may also use air pressure to level the suspension air bags and may or may not have hydraulic levelers as part of the leveling systems. Electric and Hydraulic levelers are easily distinguished by the shape of the ‘jack’ legs: Electric ones have a square tube usually with holes punched into them and have an electric motor at the top of each leg that turns a screw-drive mechanism inside the leg that extends or retracts the inner section. These are self- contained units with only a wiring harness connected to them. Hydraulic systems have a round cylinder with fluid carrying hoses connected to them and a central hydraulic pump located somewhere under the RV with multiple hoses and wiring coming to this operating unit. This style extends a round, chrome plated cylinder which has a round base. Both systems will have a control board mounted in the driver’s area of the RV and both may have an auto-level mode in addition to a manual levelling one. Modern leveling systems use four jack levelers and are controlled to raise the chassis in such a way as to avoid chassis twisting. Usually the front is deployed first, then the rear and then the system (or the operator) slowly adjusts side to side and front to back to reach the optimum level. It is important to avoid raising either end or either side too much, since this can twist the chassis. Some older systems used a three point system which deployed the single centered front jack first, followed by the two rear jacks and then levelled as above. Under the Recreational Vehicle Industry Association (RVIA) requirements, any RV chassis produced after January 1, 2007, must have the slideout and leveling system powered by the chassis battery. This change requires the engine to be running in order to provide maximum voltage to those systems. On coaches that have air suspension combined with a hydraulic levelling system, usually the air is expelled from the air bags and then the hydraulic levelers level the coach. Some then use air to finish the leveling and have a small air compressor to compensate for air loss and/or movement inside the RV that may affect the optimum level. There are also some diesel powered RVs that do not have any leveling jack ‘legs’; they merely depend upon using the air in the suspension to level the coach when parked much as they do when the coach is driven. These systems also have a small make-up air compressor to compensate for leveling variations and air leakage when parked. Since electric systems are fairly straight forward, and air systems are integrated into the coach chassis levelling systems, most of this article will focus on the hydraulic leveling systems. T here are two common types of hydraulic leveling systems found on modern RVs: Those that use hydraulic pressure to extend the ‘jack’ and one or more springs to retract the ‘jack’ (as in photo to the left), and those that use hydraulic pressure to both extend and retract the ‘jack’, (as in the photo to the right). Each has benefits and downsides and it is important to understand the difference, especially if maintenance is required. On the systems that have a spring system for retraction, hydraulic pressure is used to extend a chromed ram shaft from the jack body and when the system is signaled to retract the leg, the hydraulic pressure is released and the spring(s) bring the jack to the fully retracted position. Obviously this requires the control that releases the pressure to operate correctly and the spring(s) to have sufficient tension to overcome the weight of the lowered section and the fluid pressure in the leveler and hoses. As time goes on the spring may lose some of its tension, resulting in jack legs that do not fully retract. On fully hydraulic systems, the jack leg is under pressure as it is lowered to level AND as it retracts the jack leg back up to the resting position. The control systems simply reverses the flow of hydraulic fluid to extend the jack leg and to retract and retain the leg in the ‘Up’ position. This system requires fluid pressure in the complete system of hoses all the time. Electric levelers require minimal maintenance since they come pre-lubricated as installed and the operating screw mechanism is mostly covered inside the extended portion of the jack leg. As with all systems keeping the leg clean reduces issues and ensuring the leg extends onto a flat surface reduces the chance of damaging the leveler. Most systems have an auto retract function, should the coach driver attempt to move the coach with the leg extended. Cleaning and maintaining the electric connections is important and we recommend spraying these with Corrosion Block®to inhibit corrosion. Ensure that both the positive and negative battery connections themselves are clean and corrosion free. Also check, clean and spray the ground connection where the negative cable attaches to the frame. Many Routine maintenance of hydraulic levelers involves wiping the chrome leg with a soft cloth to remove any sand and/or grit that may damage the seal between the chrome leg and the jack body. Keeping the area between the two sections around the seal is important to maintaining the jack. If the jack is extended for long periods of time, especially in areas where there is salt in the air, then coating the chrome portion with a Heavy Duty Silicone spray will provide some extra protection. Check each jack for fluid leaks, both where the fluid lines are connected to the jack, as well as around the seal. Fluid pooling in the jack base is the first indication of a leak. If fluid is present, then cleaning the seal area between the two sections of the jack is the first step. Retract and extend the jack a few times to see if the offending gritty particle has been ejected. If the leak continues, then spray the seal area with WD40 (a petroleum based solvent) that may swell the seal enough to eliminate the leak. Extend and retract the jacks and observe the jack for a few weeks to see if it is still leaking. If it is, then removal of the jack and replacement of the seal is indicated. Most hydraulic repair shops can rebuild the jack, even though some jack makers state that their leveler cannot be rebuilt. For spring style levelers, look at the springs for signs of wear at the connection points. Metal fatigue does occur and if the spring breaks, the jack will not retract without applying a lot of pressure on the base. Many hydraulic leveling systems require routine fluid changes to maintain their ability to extend the jack leg. Check the maker’s operating and maintenance manual for specific instructions on the particular system installed on your RV. If a fluid change is recommended then just the fluid in the reservoir is changed, sometimes as frequently as every two years. The fluid, which is often transmission fluid, is drained from the pump system reservoir when all of the levelers are fully retracted. P owerGear (now a division of Lippert Components Inc.) and HWH supplied many of the systems found on RVs. They have two popular pump systems: One has a vertical round metal reservoir with a drain bolt near the bottom and a reservoir fill located near the top usually on an angle to the cylinder. It may have a simple bolt in it (the angled one in the photo of this type of system) although most new systems have the level warning sensor installed in this opening rather than beside it as in the photo. To add fluid the sensor wiring is disconnected, it is removed, fluid added until it runs out, then the sensor is reinstalled and the wiring reconnected. If on the control panel, the low fluid light comes on, then add fluid as described above. Newer systems use an opaque plastic reservoir, which may have a drain plug. If not, then the fill plug or level indicator can be removed (after disconnecting the wiring harness) and the fluid is siphoned out. When it is emptied of fluid, refill to the proper level marked on the exterior of the tank. If the label marking the level is missing, then fill to between ¾ and 7/8 of the capacity of the container. Annual inspection and maintenance of the battery cable connections is important for hydraulic systems since they use the equivalent of an engine starting motor to power their systems. Usually there is a high current fuse near the battery which protects the wiring and a fuse near the control panel and one near the actual leveling jack control valves near the pump and reservoir. It is a good idea to check your system over and find these fuses so that should one fail you will know where to locate them to replace. Check all of the hydraulic lines for signs of deterioration, especially where these lines pass through the coach frame and also near the pump assembly. It is noteworthy that some newer PowerGear systems were supplied (to meet specific Coach manufacturers specifications), with hydraulic lines that are covered in a flame retardant plastic, since some of these lines pass near hot engine and exhaust components. This fire retardant plastic coating does not allow naturally occurring gases to escape from the line, so that when the fluid heats up, generally near the hydraulic pump, these gases produce bubbles that appear in the lines. According to PowerGear in a Service Bulletin #82-L0504 dated 4-20-2011, this is a cosmetic issue, there is no fluid penetrating the rubber and it is not a reason for concern. Here is the link to this Service Bulletin. I have a 2009 coach with these lines and have not seen any change from when the coach was new, in the size or number of these bubbles. I do regularly inspect them along with my other maintenance checks. Some RV owners have gone to considerable expense to change the hoses, however it is worthwhile reading and understanding the issue before spending a considerable amount of money correcting the ‘problem’.